BRIAN FLETCHER IS GONE- Not too completely out of the realm. Fletch's draft stock was high. He seems ready and now would probably be the best time for him to go. KEVIN PATTERSON IS BACK- I know I initially listed him as a 70% chance to return. I'm ready to upgrade that to 90%. Why? Cape Cod Baseball. The premier summer league for college players. KP played in it last year and surprisingly returns this year. If KP was going pro, why would he be wasting his time playing for the Cotuit Keetlers? He wouldn't. By playing in the Cape, I think he's tipping his hand and showing Auburn fans that he's returning. ZACH ALVORD LIVES UP TO THE HYPE- Again, not completely out of the realm of possibility. Alvord was good enough to be drafted by the Braves in the 18th round and should be good enough to start Day 1 for Auburn. The two easiest areas to project are going to be OF and C. Those are no-brainers. With Fletch and Mummey leaving it frees up two spots in the OF. Two spots that are easily filled. Personally, I'd like to see Justin Fradejas in CF just based on his speed, but I think Creede Simpson will get the nod there because of his athleticism. That returns Fradejas to RF and the only spot left to fill is LF to replace Fletch. Justin Bryant has played there and has the tools to be very productive in that position. Catcher is another no brainer. Tony Caldwell should get the nod there (especially after his productive Sophomore Campaign) with Caleb Bowen handling the backup duties. CONTAINING THE KRACKEN: The rest of the infield is where the speculation comes into play. Of course, all of these decisions will ultimately rest with Coach John Pawlowski, but here's is my best guess/best wish for the 2011 Tigers. I honestly think Kevin Patterson should not DH. At least not full time. It limited his at bats, it made him easily predictable, and it never gave him time to work on his shortcomings. The early part of the season is where you can give KP a chance at First Base. 1B is where he projects in the pros, it's where his limited range will do the least damage and it would put him in the lineup everyday. So what happens to DH. To me, this has to go to Dan Gamache. Despite his problems in the field, DG is a quality hitter. He's patient, he can hit to all fields, and he has surprising power. DH doesn't have to be a David Ortiz monster, it needs to be a consistent and timely hitter. Dan fits all those roles. It moves his glove (which some could consider a liability) off the field and keeps his bat (which is his best attribute) consistently in the lineup. THE ALVORD EQUATION: Now comes the fun part, or the maddening part. If Alvord comes to Auburn (which seems very likely at this point). He has the tools to play Day 1. The question becomes where do you play him? Currently, he's built for a SS role. That's where his range is best used and where he is most comfortable. As he grows and bulks up (which he's expected to do) then he becomes more of a 2B fit (where he's projected to play in the pros). Well there's one problem with that. 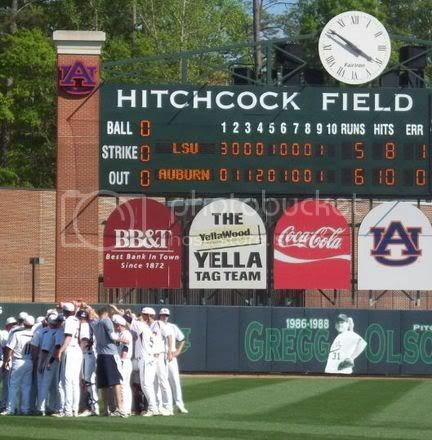 Auburn already has a 2B (Justin Hargett) and a SS (Casey McElroy). Yes, both of these guys had their defensive woes but both at 2 year starters (going into 3 year starters) at those positions. Hargett was plagued all season by his shoulder injury and was never 100%. So who loses out? Alright so here's where we play musical chairs with the infield, with that open chair being 3B. All 3 guys (Alvord, Hargett, and McElroy) should see the field and one of them will be playing 3B. A position they will be unaccustomed too, but which they could pick up easily. I wouldn't put McElroy at 3B just on his height (he's 5'9). Hargett (5'10) isn't really any better height wise, but his field stance lends itself better at 3B. CMac tends to squat really low when he plays the field. I think putting Alvord (who's 5'11) at 3B would be a waste just because of Alvord's range. At SS he can cover the most ground easily and his plus-arm makes him valuable on the right side of the infield. The arm strength and range are what makes me think McElroy should move to 2B. He can still have range but it reduces the chance of a missthrow to 1B (his biggest problem last year).